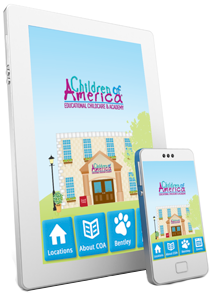 Connect with the Nation's Leader in Educational Childcare with the COA Mobile App. We're with you wherever you are! Quickly contact with your local school and share with a friend. Search or find the closest location, see them on the map and get directions. Review and save your local school's monthly meal plan. Check out what's happening at your local school. Event listings include information about upcoming events and activities at each individual school. These calendar events can be easily added to your own calendar. View Children of America's social media presence, all in one place. Keep up with friends and stay up to date on the latest discussions about what's going on in the COA community. Browse "An Apple A Day" Nutrition blog for healthy eating tips and recipes. Save and share instantly as nutrition news comes in. Access the newest Bentley book right on your mobile device for easy online reading anywhere, anytime. Browse the Bentley gallery for action videos and photos. Get the latest in the traveling Bentley game as he visits preschoolers and families. Check out the latest on the "Bentley In Action" video channel. Considering Children of America? Find out what makes COA different. iPhone is a trademarks of Apple Inc.